MULTI PARCEL Public Auction with RESERVE - Kevin Hohlen & Marilou Hohlen Properties LAND AUCTION - Saturday, February 16th, 12 PM at Wysox Township Building, Milledgeville Registration at 11:00, Auction at 12:00 PM sharp. Lunch provided by of Compeer Financial. 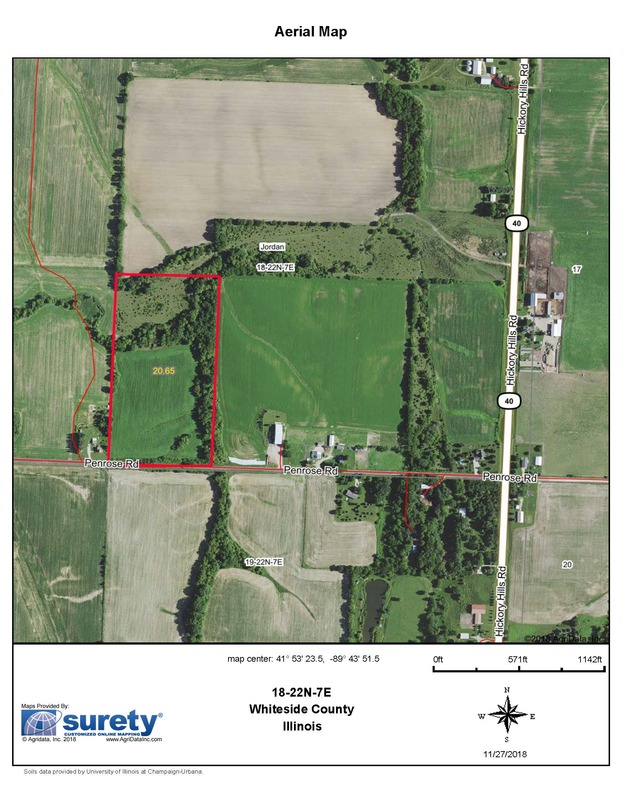 KEVIN HOHLEN FARM - TRACT #1 The approximate 78 acres conveniently located on Route 40 in Whiteside County. Property is approximately 55 tillable acres with the balance of wooded pasture. Excellent hunting and recreational property with income potential on crop acres. 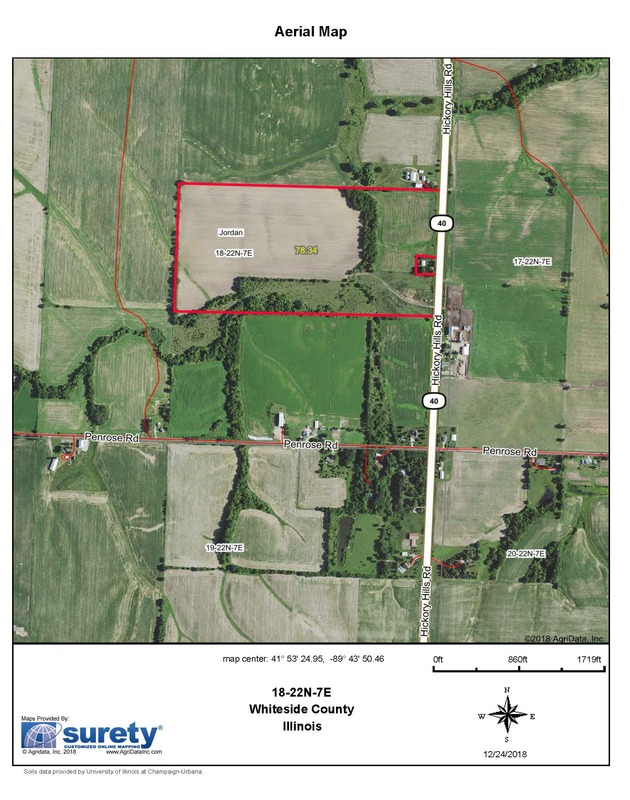 TOTAL ACRES: 78 Approximate TILLABLE ACRES: Approximately 55 SOIL PI: 121.7 Osco Silt Loam, Greenbush Silt Loam, Seaton-Timula Silt Loam TAXES: 2017 $13.33 per acre; Tax Parcel #0518400002/Subject to split Final price is subject to final survey after auction. KEVIN HOHLEN FARM - TRACT #2 The approximate 20 acres located on Penrose Road in Jordan Township, Whiteside County. Property is approximately 10 tillable acres with the balance of wooded acres and pasture. This property is ideal for someone wanting a recreational property or build a new home! TOTAL ACRES: 20 Approximate (Subject to Survey) TILLABLE ACRES: 10 Per Surety Agridata SOIL: 113 PI Silton-Timula Silt Loam, Orion Silt Loam, Fayette Silt Loam. TAXES: 2017 $11.58 per acre; Tax Parcel - #0518400001/Subject to split Final price is subject to final survey after auction. KEVIN HOHLEN FARM - TRACT #3 The approximate 17 acres conveniently located on Penrose Road and Route 40 in Jordan Township, Whiteside County Illinois. Property has approximately 11 tillable acres with the balance of wooded/pasture acres with a creek. This property is ideally suited to build your dream home with plenty of room for the horses to run! 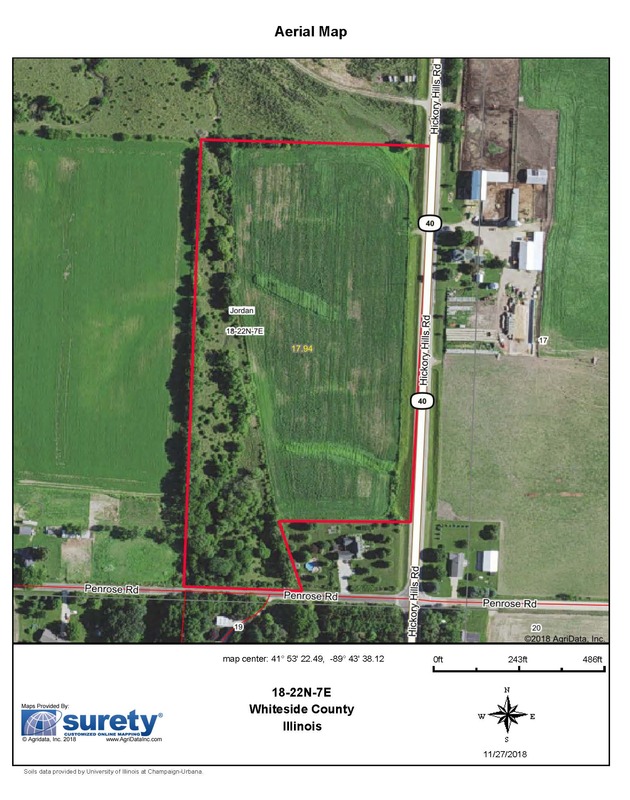 TOTAL ACRES: 17 Approximate (Subject to survey) TILLABLE ACRES: 11 Per Surety Agridata SOIL: 116.2 PI Fayette Silt Loam, Orion Silt Loam TAXES: 2017 $11.71 per acre; Tax Parcel #0518400008 Final price is subject to final survey after auction. MARILOU HOHLEN FARM - TRACT #4 (Tract 4a & 4b combined) A beautiful farmhouse sitting on approximately 78.93 taxable acres located on Route 40. Plenty of barns and machinery storage to support the cattle feedlot operation. Complete with silo, tube feeder and solid fencing. This property is ideal for setting up a show cattle and breeding operation. TOTAL ACRES: 78.93 Approximate (Subject to survey) TILLABLE ACRES: 74.38 Per Surety Agridata SOIL: 117 PI Seaton-Timula Silt Loam, Greenbush Silt Loam, Osco Silt Loam TAXES: 2017 $2,460; Tax Parcel #0517300001 MARILOU HOHLEN FARM - TRACT #4a (House, buildings and feedlots only) A beautiful farmhouse sitting on approximately 7.5 acres located on Route 40. Plenty of barns and machinery storage to support the cattle feedlot operation. Complete with silo, tube feeder and solid fencing. This property is ideal for setting up a show cattle and breeding operation. TOTAL ACRES: 7.5 Approximate (Subject to survey) TAXES: Subject to parcel split by Assessor; Tax Parcel #0517300001 Final Price is determined by final survey after auction. MARILOU HOHLEN FARM - TRACT #4b (Farmland only) Approximately 72 acres loacted on Route 40 and Penrose Road, Jordan Township, Whiteside County. Very nice tillable farm. TOTAL ACRES: 78.93 Approximate (Subject to survey) TILLABLE ACRES: 74.38 Per Surety Agridata SOIL: PI 117 Seaton-Timula Silt Loam, Greenbush Silt Loam, Osco Silt Loam TAXES: 2017 $2,460; Tax Parcel #0517300001 Final Price is determined by final survey after auction. KEVIN HOHLEN FARM - TRACT #5 (5a and 5b combined parcels) Located in Elkhorn Township in Carroll County and conveniently located on Sunshine road. Nice farmhouse that is partially remodeled and ready for you to finish to your taste! Nice pasture acres with excellent tillable soil. Plenty of room for the livestock! TOTAL ACRES: 136 Approximate (Subject to survey) TILLABLE ACRES - 92 Per Surety Agridata TAXES: 2017 Subject to parcel split by Assessor; Tax Parcel #021631200001 HOHLEN FARM - TRACT #5a (House, buildings & front pasture only). Located in Elkhorn Township in Carroll County and conveniently located on a paved road inside Milledgeville School District! This 3 bedroom farmhouse located on approximately 7 acres (Subject to survey) with plenty of pasture for a horse or two! TOTAL ACRES: 7 Approximate (Subject to survey) TAXES: Subject to parcel split by Assessor; Tax Parcel #021631200001 Final price is subject to final survey after auction. HOHLEN FARM - TRACT #5b (130 acres of combination tillable and pasture) The approximate 130 total acres with approximately 92 tillable acres and the balance is pasture with a small drainage creek. Very nice combination farm with grass pasture for cows and tillable income. 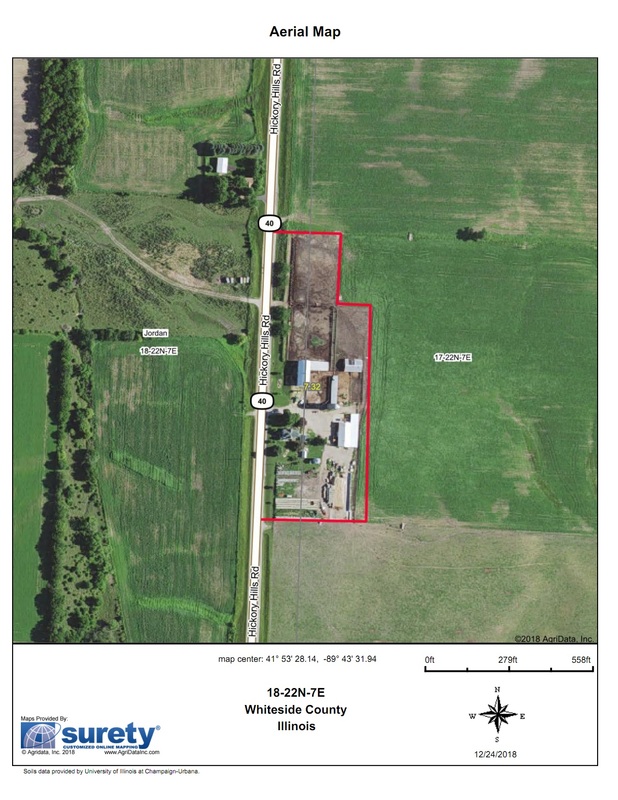 TOTAL ACRES: 130 Approximate (Subject to survey) TILLABLE ACRES: 92 Per Surety Agridata SOIL: 128.8 Lawson Silt Loam, Osco Silt Loam, Osco Silty Loam TAXES: Subject to parcel split by Assessor; Tax Parcel #02131200001 Final price is subject to final survey after auction. HOHLEN FARM - TRACT #6 This property is a much desired wooded property approximately 25 acres bordering the Elkhorn Creek that will make a beautiful setting for a new home. Located on a paved road and in Milledgeville School District provides easy access. The property has many mature Walnut trees and is a well travelled route for deer and turkey as well as other wildlife. TOTAL ACRES: 25 Approximate (Subject to survey) TAXES: Subject to parcel split by Assessor; Tax Parcel #021631200001 Final price is subject to final survey after auction. MULTI PARCEL Public Auction with RESERVE - Kevin Hohlen & Marilou Hohlen Properties LAND AUCTION - Saturday, February 16th, 12 PM at Wysox Township Building, Milledgeville Registration at 11:00, Auction at 12:00 PM sharp. Lunch provided by Compeer Financial.